As pictured above: If the two components of the waveform are not symmetrical, there may be a problem with the signal. The majority of electronic waveforms encountered when using an oscilloscope are periodic and repetitive, and they conform to a known shape. However, there are several wave characteristics to consider in order to train your eye to look at the various dimensions. 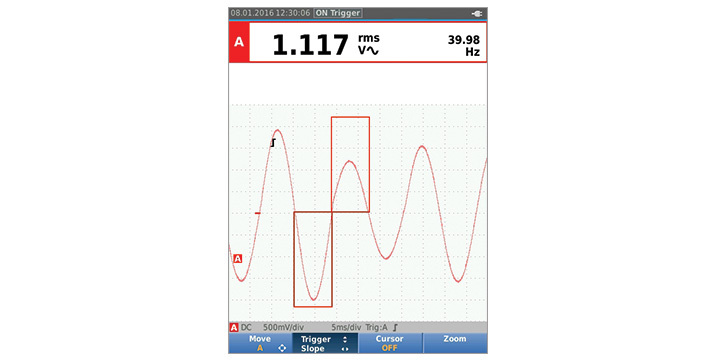 Some Fluke ScopeMeter® Test Tools offer a proprietary onboard algorithm called IntellaSet™ to assist waveform analysis. 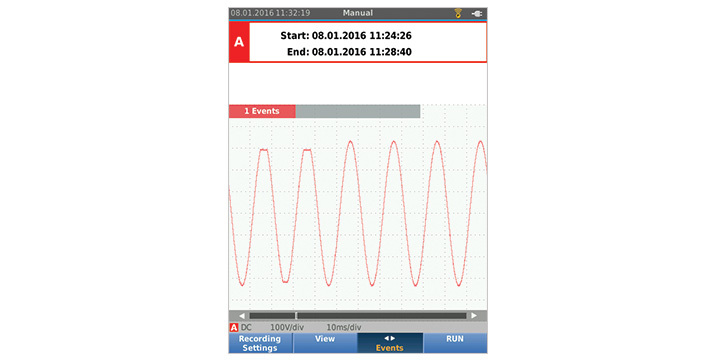 Once the waveform is displayed on screen, if initiated, the new IntellaSet™ technology evaluates the signal and associated waveform by comparing it against a database of known waveforms. 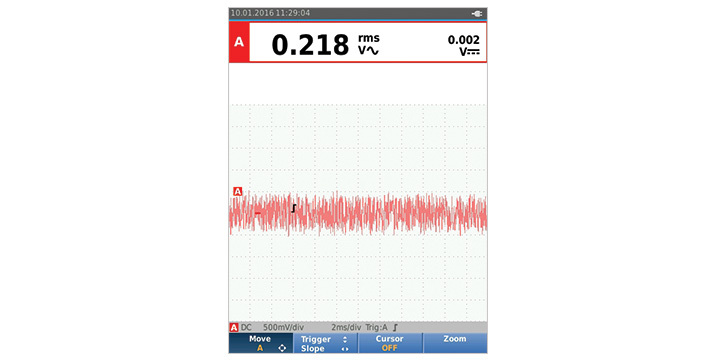 The ScopeMeter® Test Tool then intelligently suggests critical measurements to characterize the unknown signal so potential areas of concern can be identified. 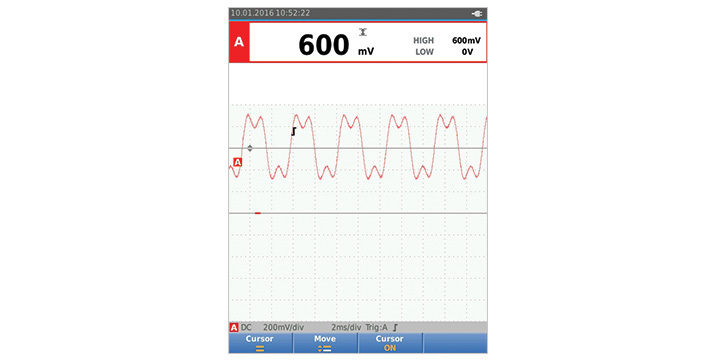 As an example, when the measured waveform is a line voltage signal, the V ac + dc and Hz readings are automatically displayed. 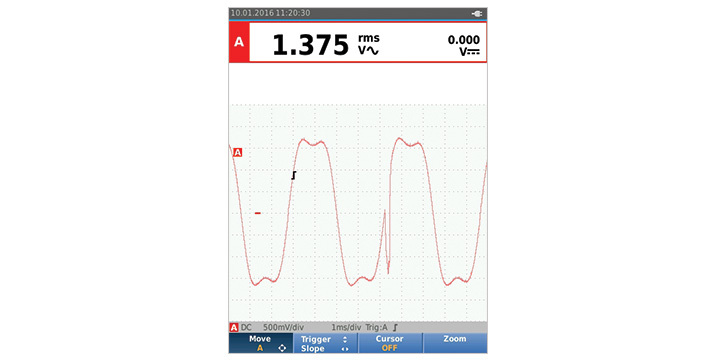 While intelligent programs help minimize the time it takes to scrutinize waveforms, it’s important to know what to look for when using an oscilloscope. Shape. Repetitive waveforms should be symmetrical. That is, if you were to print the traces and cut them in two like-sized pieces, the two sides should be identical. A point of difference could indicate a problem. Rising and falling edges. Particularly with square waves and pulses, the rising or falling edges of the waveform can greatly affect the timing in digital circuits. It may be necessary to decrease the time per division to see the edge with greater resolution. Amplitude. Verify that the level is within the operating specifications of the circuit. Also check for consistency, from one period to the next. 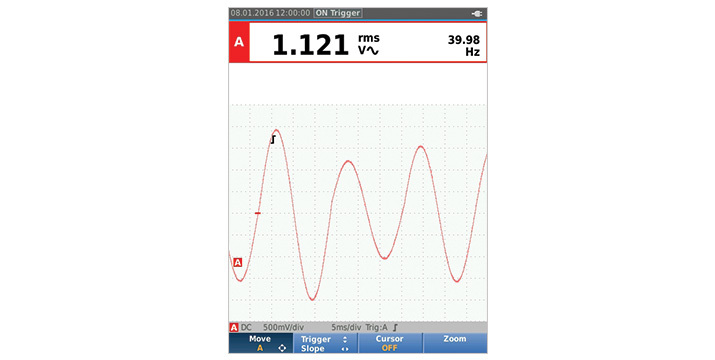 Monitor the waveform for an extended period of time, watching for any changes in amplitude. Amplitude offsets. DC-couple the input and determine where the ground reference marker is. Evaluate any dc offset and observe if this offset remains stable or fluctuates. Periodic wave shape. Oscillators and other circuits will produce waveforms with constant repeating periods. Evaluate each period in time using cursors to spot inconsistencies. Here are typical anomalies that may appear on a waveform, along with the typical sources of such anomalies. Transients or glitches. 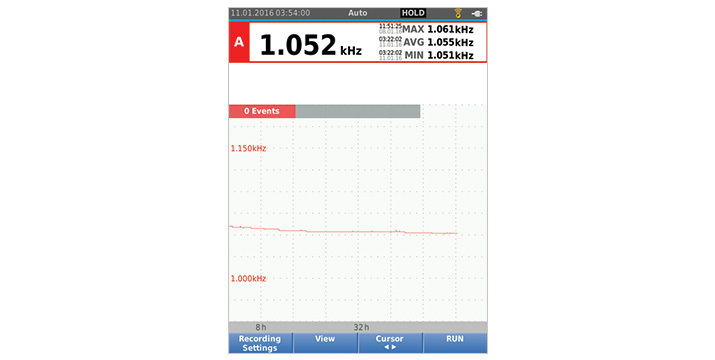 When waveforms are derived from active devices such as transistors or switches, transients or other anomalies can result from timing errors, propagation delays, bad contacts or other phenomena. Ringing. Ringing can be seen mostly in digital circuits and in radar and pulse-width-modulation applications. Ringing shows up at the transition from a rising or falling edge to a flat dc level. Check for excessive ringing, adjusting the time base to give a clear depiction of the transitioning wave or pulse. Momentary changes in the measured signal generally result from an external influence such as a sag or surge in the main voltage, activation of a high-power device that is connected to the same electrical circuit, or a loose connection. 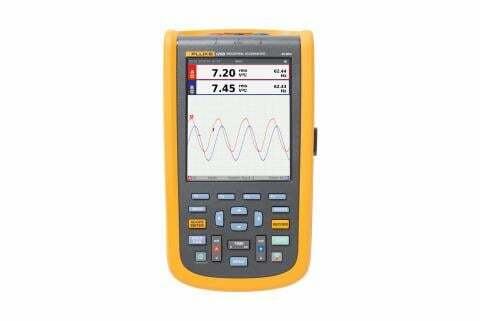 Use the ScopeRecord function and Event Capture mode of the ScopeMeter Test Tool to monitor the signal over long periods of time to detect the elusive momentary events. Drift. 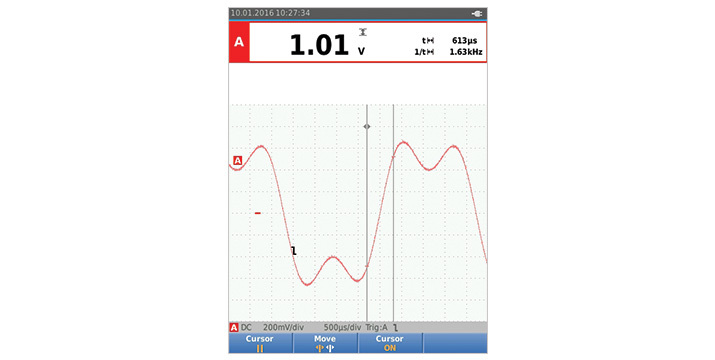 Drift—or minor changes in a signal’s voltage over time—can be tedious to diagnose. Often the change is so slow that it is difficult to detect. Temperature changes and aging can affect passive electronic components such as resistors, capacitors and crystal oscillators. 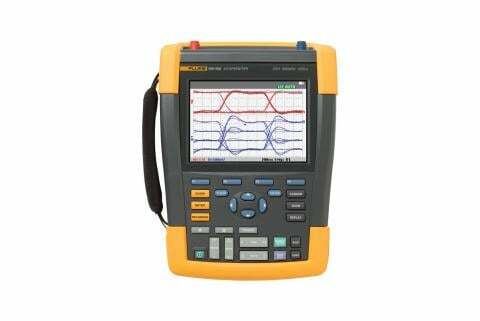 One problematic fault to diagnose is drift in a reference dc voltage supply or oscillator circuit. Often the only solution is to monitor the measured value (V dc, Hz, etc.) over an extended time. As pictured above: Use cursors and the gridlines to evaluate the rise and fall times of the leading and trailing edges of a waveform. As pictured above: Use horizontal cursors to identify amplitude fluctuations. As pictured above: Evaluate waveform DC offsets. As pictured above: Evaluate period-to-period time changes. As pictured above: A transient is occurring on the rising edge of a pulse. As pictured above: A ground reference-point measurement showing induced random noise. As pictured above: Excessive ringing occurring on the top of the square wave. As pictured above: A momentary change of approximately 1.5 cycles in the amplitude of the sinewave.